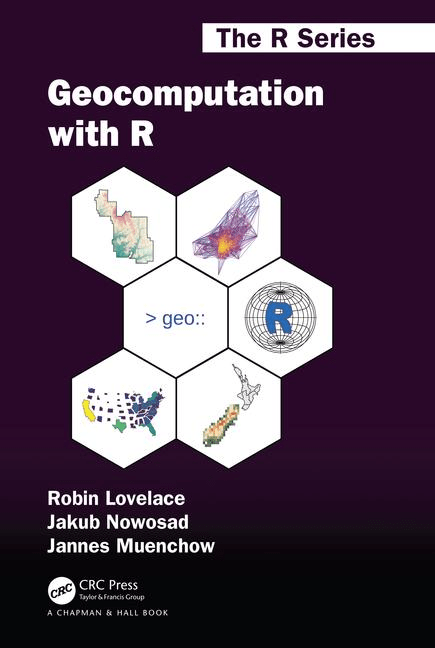 This is the online home of Geocomputation with R, a book on geographic data analysis, visualization and modeling. Note: This book has now been published by CRC Press in the R Series. You can buy the book from CRC Press, Wordery, or Amazon. Inspired by bookdown and the Free and Open Source Software for Geospatial (FOSS4G) movement, this book is open source. This ensures its contents are reproducible and publicly accessible for people worldwide. The version of the book you are reading now was built on 2019-04-24 and was built on Travis. To raise an issue about the book’s content (e.g. code not running) or make a feature request, check-out the issue tracker. Further details can be found at github.com/Robinlovelace/geocompr.